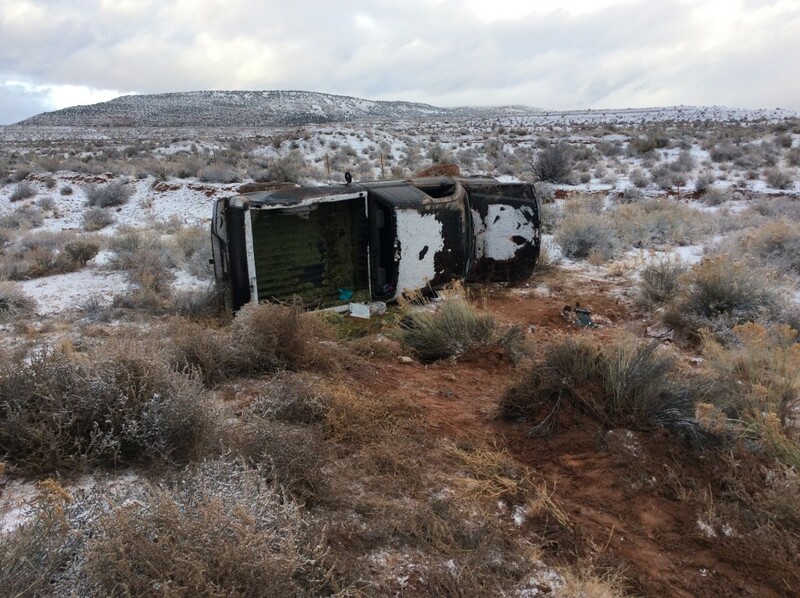 MOHAVE COUNTY, Ariz. – A woman was transported to the hospital Thursday morning following an icy single-vehicle crash near Pipe Spring National Monument in Mohave County, Arizona. 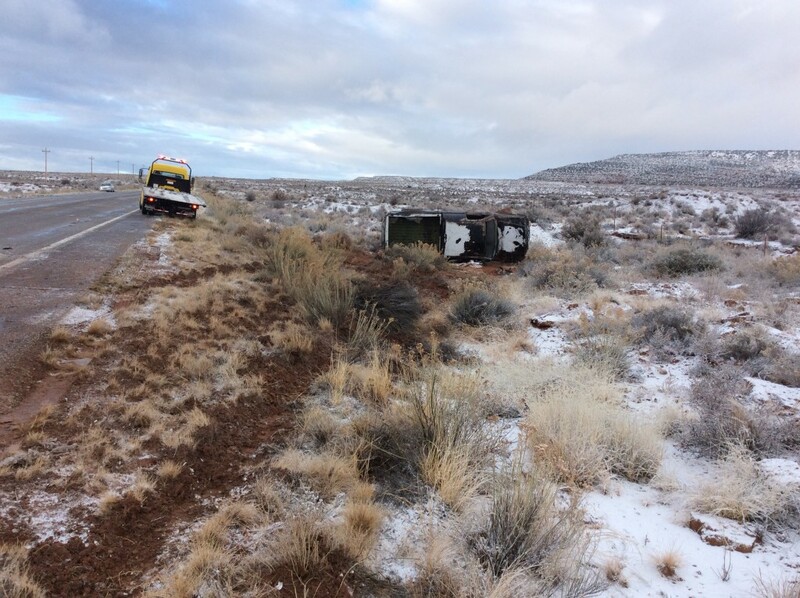 The crash occurred at about 6:45 a.m. when a woman from the nearby Kaibab Paiute Native American tribe was traveling northbound on state Route 389, Officer Mark Gilberg, with the Arizona Department of Public Safety, said. 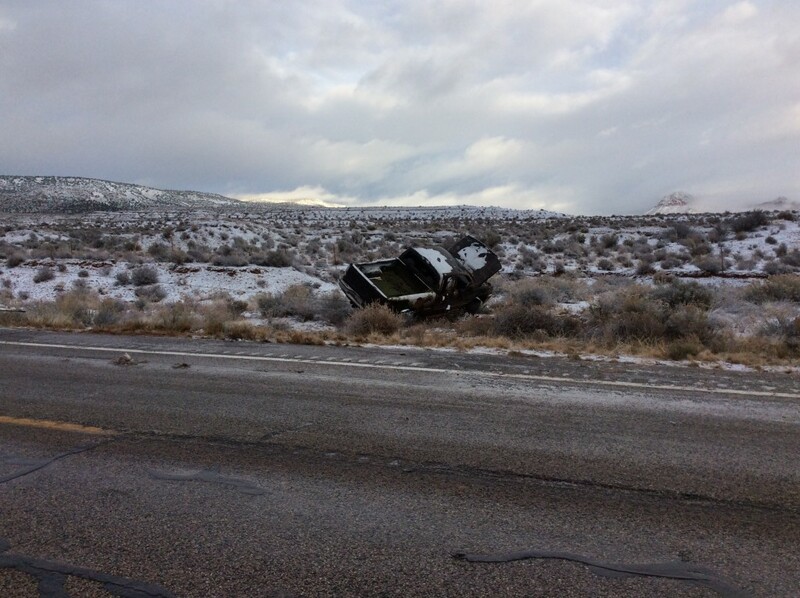 Road conditions were icy, and Gilberg said the woman lost control of her truck in the slush on the road. The vehicle left the roadway not far past the turnoff to Pipe Springs Road, landing on its side off the side of Highway 389. 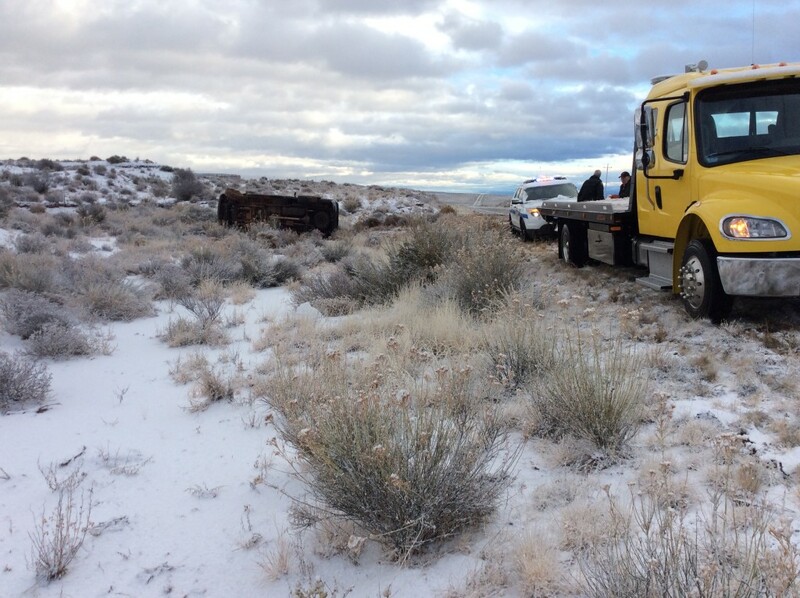 “(She was traveling) too fast – speed too fast for conditions,” Gilberg said. The woman was the only occupant of the truck, he said. 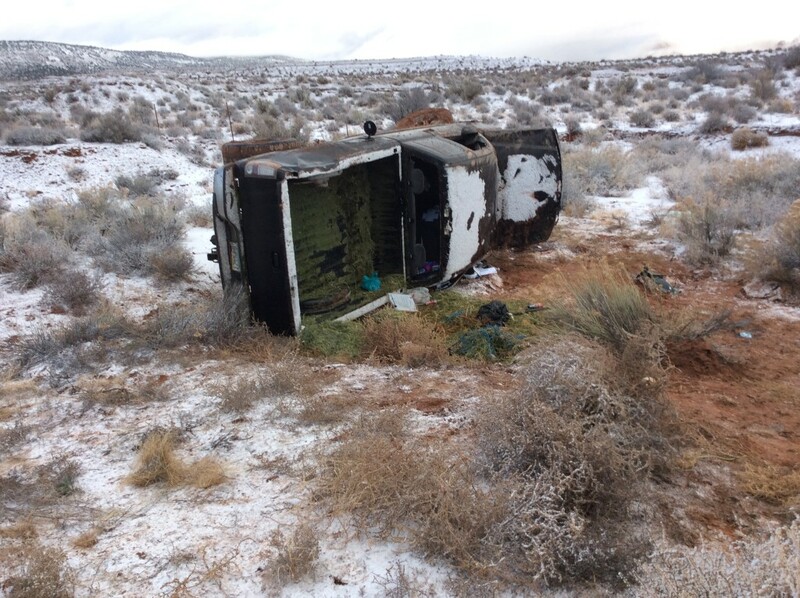 The woman was transported by ambulance to Dixie Regional Medical Center in St. George. Gilberg said he did not know the nature of her injuries. 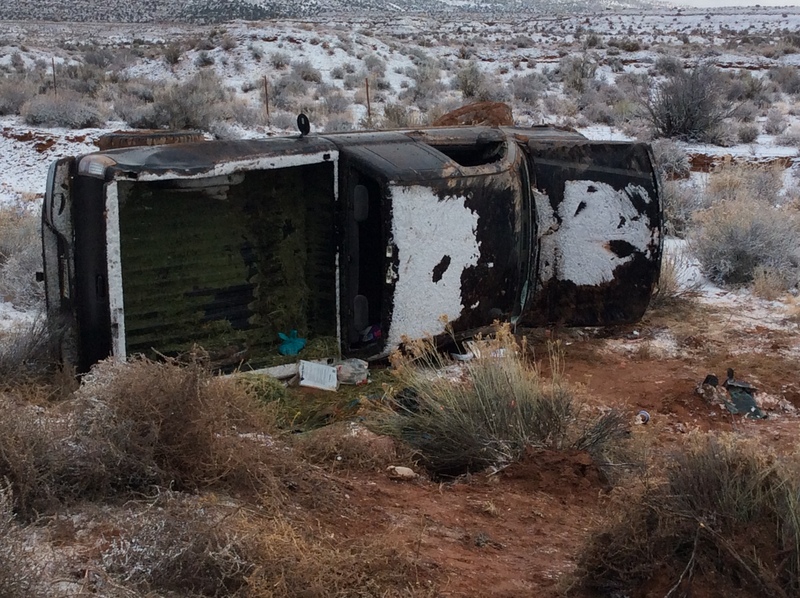 Emergency personnel from Arizona DPS, the Bureau of Indian Affairs and the Hildale-Colorado City Fire Department responded to the scene. 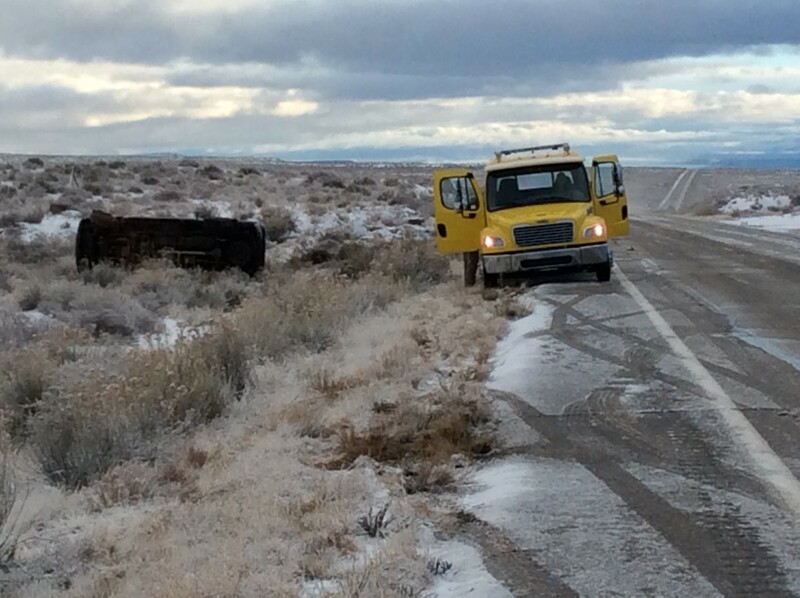 Traffic was able to proceed through the area almost immediately after the crash occurred, Gilberg said, but it took responders about an hour and a half to get the scene cleared. The disabled truck was towed from the scene by Ramsey Towing out of Kanab about two hours after the accident took place. poor lady, had her brakes on the whole way. looks like she was just trying to get some food for her babies! (hay) hope your ok momma! going faster than 25 is too fast on that road and 59 with snow on it. when i drive 59 and its snowing, i have to put my front tire on the sleeper and drive 15 to 20 mph b/c A. i can’t see the road at all (snows over tire prints right away of previous vehicle) B. unless your vehicle is perfectly weighted those roads are so traveled the oil and now combo just slips and slides no matter what you do.. and then i get all these ppl passing me and i think.. what gives? how can they be driving that fast without sliding (i feel jealous and incompetent).. until i come upon them all slid off the road. i can’t even imagine what pine valley, diamond valley and those areas are like to drive in the winter. Well the Speed Limit sign says 65 so I can do the usual 10 to 15 over………..right?